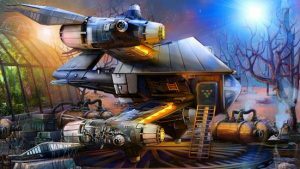 Space Legends Edge of Universe : Take the space quest of a lifetime in this breathtaking hidden object adventure game. Solve riddles and puzzle games to unveil secrets of the Universe and return home. With a science fiction storyline and your favourite hiding games features, this HOG is your ticket to incredible adventures. Take on a role of a space wanderer who travels to the edge of the Universe in order to save the day. Find the hidden city of the advanced civilization that once landed on this remote planet. Explore the devastated town in search for hidden objects and clues. Discover the mystery that caused its decay centuries ago, solve puzzles and find a way to get out of this world before it’s too late. Nice idea Overall, I enjoyed the game. A few frustrations. The written language within the game is English and something else. If, you are going to charge English speakers to play a game, it is only ethical that the player is able to read ALL verbiage. There are 2 or 3 instances where the player is expected to combine items in the inventory, in order to use items together; chisel and hammer. There is nothing to inform player. I had to find this on my own via walk-through. Absolutist ltd games are Absolutely Awesome!!! Love this game!!!! Impressed I’m a big fan of HOA games & this one is unexpectedly very good.